FunDog: More Reading & Thinking Word Analogies offers children additional practice in higher level thinking and developing their sight word vocabulary. 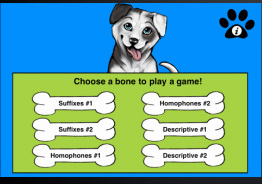 We want to make sure that Fundog users can easily get to the Game Center after completing each analogy game. For those of you not yet registered, notice the game center icon on the iPhone's main screen. Click on it, and it will take you through the log-in process. When playing FunDog for the first time, you will be prompted by a pop-up window to log into Game Achievements. Just click the accept button and you will be able to view your game results.